“Oh yeah,” the Buck Trent show is one entertaining, lively and exciting way to start a day in Branson. From start to finish, this show is quality non-stop comedy, singing and music presented by some of the most talented singers and musicians in Branson. 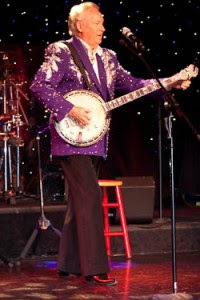 Obviously, this show has a star, Buck Trent, who lives up to his billing as a “premier international five string banjo picker, master musician, hilarious humorist, and entertainer extraordinaire,” but from an audience entertainment perspective it’s the way those talents are blended in with the rest of the cast that helps make the show so special. The singing provided by Kenny Parrott and Melody Hart along with their instrumental playing, Parrott on the guitar, Hart on the fiddle and mandolin; Rob Blackwood, drums; Dave Clark, bass guitar; Bruce Hoffman, steel guitar and fiddle and Jonathan Black on the piano and saxophone combine with Buck to provide two of the fastest and most entertaining hours in Branson morning, noon or night! From the lively opening number “Country Music Has Gone to Town” to the exciting “dueling fiddles, banjo, and guitar” finale there’s is not a dull or unexciting moment in this show. It might be Buck playing a special acoustical guitar while Melody sings the Dolly Parton classic, “My Coat of Many Colors,” Buck telling one of his funny stories, Kenny singing “You Were Always On My Mind” or any one of a number of other things, but the show is a constant stream of entertaining energy leading seamlessly from one thing to the next. Buck is on stage just about the whole show and keeps things moving with his humor and playing. It’s amazing to watch the versatility of this talented performer on the banjo, guitar, and mandolin in everything from solos to duets and whole cast numbers. His instrumental duet of “Somewhere My Love” (“Laura’s Theme” from the movie “Dr. Zhivago”) and his “Boogie” number in the second half of the show are just two of the highlights of his performance. The primary vocals are provided by Kenny and Melody. Kenny does a great job on numbers like “Folsum Prison Blues,” “South of the Border” and others. Melody’s rendition of “Just For What I Am,” her duet with Buck of the Porter Wagner Dolly Parton classic, “If Teardrops Were Pennies” and other numbers were very well done. As good as the singing is, not only in the featured solo vocals, but in other parts of the show such as the gospel medley, it is the vibrant and exciting musicianship that makes this a unique must see show. From Buck right down the line, each of these musicians is excellent. The first two numbers of the show instantly get the cast involved and by the end of the third number, even before Bruce and Melody fiddle their way through the fiddle standard, “Orange Blossom Special” the audience knows they are in for a special musical treat. 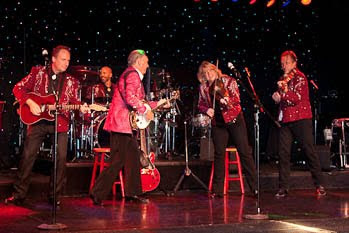 Although there are many highlights, the duet with Buck and Kenny of “Laura’s Theme,” the fiddle playing of Bruce and Melody, particularly their presentation of the “fiddling medley” in the first half and the “William Tell Overture,” in the second half along with Jonathan’s performance of “Yakety Sax” on the saxophone stand out. At the end of the day, well, rather the morning, however, it is the numbers using the full instrumentality and power of the whole cast together that make this show so special. Although there were many, two can serve to illustrate the point. One was the unique and lively start to the second half of the show, “Down Yonder” with its featured mandolin quartet. What a unique and exciting way to start the second half of the show. The other is the shows “Dueling Banjos” number done Buck Trent show style. It blends fiddles, a banjo and a guitar into a “dueling” version unlike any you have ever heard before. For additional information on the Buck Trent Morning Show or any other Branson show, attraction or lodging feel free to contact the Branson Tourism Center (BTC), one of Branson’s largest and most respected vacation planning services and sellers of Branson show and attraction tickets and lodging. BTC can be reached by calling 800-785-1550 or through its website www.BransonTourismCenter.com.